"Curly" gets a hug after bringing home the blue at North American! Daughter of MFI Peruvian Total Asset - Futurity Champ 2000 - and granddaughter of full Accoyo Dracula - a LEGEND in the breeding world...this girl has it all! A dense, stylish, full Peruvian charmer with a sweet personality! 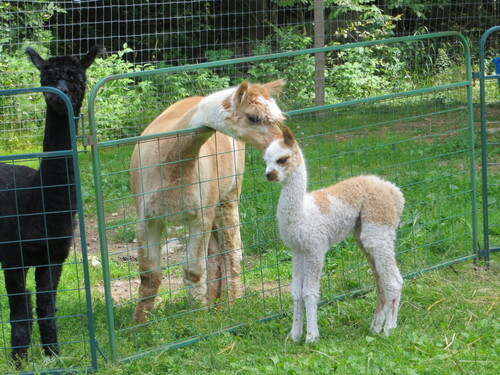 In May, 2012, B-Luck and High Peaks Algonquin produced an amazing cria - Mtn Meadows Magnificent Masquerade! This guy is QUITE the character - with his black tap shoes, white socks, neck & head, and black mask. And a wonderful personality and gorgeous fleece to boot! Lancaster's Luck (a.k.a. "Curly") is a beautiful pattern, much like his brother Masquerade, but more subtle. His fleece is full of tight curls, AMAZINGLY dense, and quite fine. Looks like "Curly's" headed for excellence in the show ring! He swept North American with blue ribbons in the multi-halter with Judge Amanda VandenBosch and adult public relations classes with Judge Polly Michaelis! And then he followed his little human buddy through both the junior public relations and showmanship classes to tie for first there too! 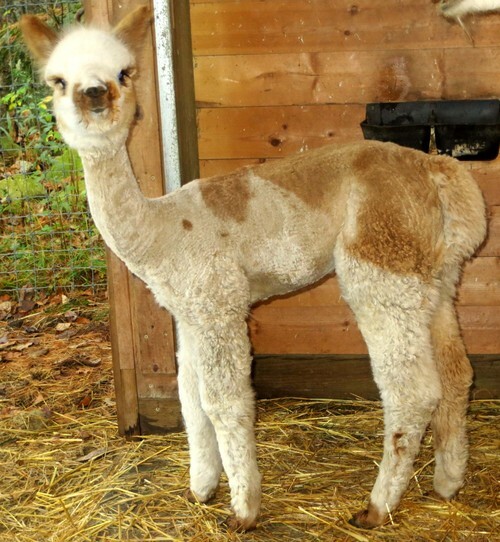 He's an incredibly sweet little guy with a gentle attitude and WONDERFUL fleece! We're looking forward to showing him in the fall - Look for him at the Green Mountain show in Vermont! 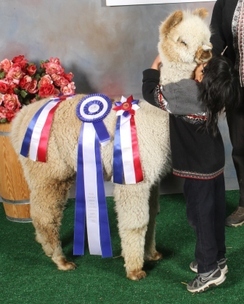 2014 National Alpaca show, Photo Competition: "Alpacas Interacting"